Skate Like a Girl's mission is to empower young people, especially young women, to grow into strong, confident leaders who promote and implement social equity. 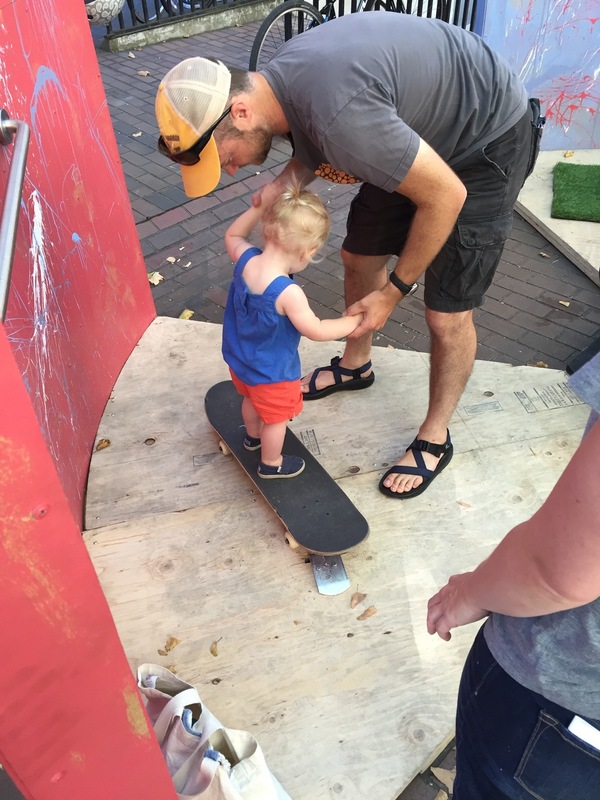 As volunteers for the Seattle Design Festival, we were charged with creating an installation for Skate Like a Girl that embodied the theme, Design for Equity. I headed a lot of the concepting and design work, and facilitated SDF staff, volunteer designers, and our contractor Lease Crutcher Lewis. In the theme of 'Design for Equity,' we aimed to create an installation that would invite all types of people to feel more comfortable with skateboarding. We settled on creating a safe-and-sane 'beginning to skateboarding' wall. Skateboards would be attached to the ground in fixed positions, mimicking the first 3 steps a beginner would learn in a Skate Like a Girl class. In addition to the step process, we wanted to include a way for people not able or comfortable with skateboarding to participate in the culture. We envisioned a collaborative art wall opposite the steps, where participants could paste, draw, sticker, marker, and scribble their mark. We intended to include skate brand stickers and zines for people to cut up and glue to the wall in whatever fashion they liked. Through our sessions with LCL, the installation became more circular and inviting. The separated walls also allowed for three distinct ways for people to interact with the outside walls - the art collage, a map of SkLAG's favorite skate parks, and a photo-op wall. In keeping with skate culture, all the materials for the build were either found, donated, or scavenged from work sites and built with the idea that they could be disassembled and reused at a later date. SkLAG was able to provide us with new donated helmets (for those who wanted a little extra security), and skate stickers for us to decorate with. We pre-populated the art wall Friday before the festival to get things going. Over the two day festival weekend, our installation had hundreds of visitors, no injuries, and inspired a new interest in many excited people.